18th November, 2014.The Minister of National Security, Senator the Honourable Gary Griffith conducted an aerial tour to some of the hard hit areas in Mayaro and Manzanilla on Monday November 17, to assess the gravity of the damage caused to the Manzanilla/Mayaro Road, Cedar Grove, Cernaham and surrounding areas affected by flood waters. On the aerial tour he was accompanied by the Honourable Minister Winston Peters, Member of Parliament for Mayaro, the Disaster Management Unit Team of the National Operations Centre (NOC) and the Office of Disaster Preparedness and Management (ODPM). Minister Griffith also visited the Disaster Management Unit Command Centre with Minister Peters and was given a multi-agency response brief that articulated the details of the response, the roles of all agencies and the status of the relief operations. After his assessment, Minister Griffith directed that the ODPM which is a Division of the Ministry of National Security, supported by law enforcement and first responder agencies, to continue to offer relief to all affected residents. Under the guidance of the Minister, the ODPM has partially activated the National Emergency Operation Centre, aimed at coordinating immediate support and relief operations. 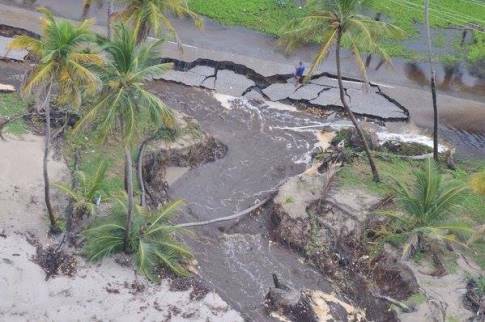 Minister Griffith notes that the Ministry of National Security stands ready to assist those affected in any way possible. He points to the fact that the various arms of National Security, via the National Operations Centre have been working hand in hand with other Ministries, to bring relief to residents and to restore some level of normalcy to the affected communities in the shortest possible time.